he BJP had alleged that buses in which party workers were returning from Shah's rally were ransacked and set on fire allegedly by TMC activists. 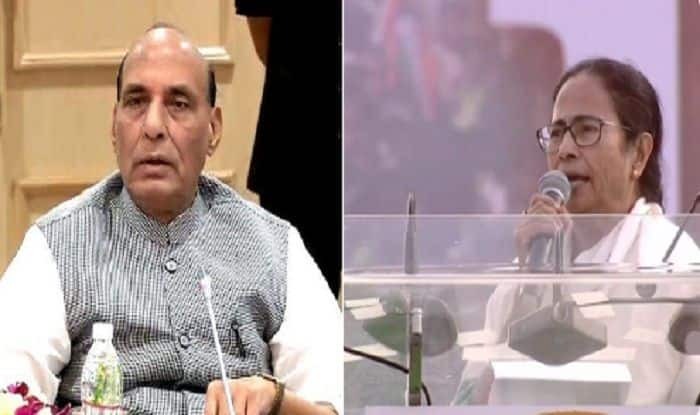 New Delhi: Union Home Minister Rajnath Singh called up West Bengal Chief Minister Mamata Banerjee and expressed serious concern over reports of violence near the venue of the rally of Bharatiya Janata Party President Amit Shah in East Midnapore on Tuesday. During the telephonic conversation, the Home Minister has reportedly asked Banerjee to take action against those who indulged in the violence. Earlier in the day, party sources had claimed that vehicles ferrying BJP workers were set on fire in clashes that broke out following Shah’s rally. Three persons were reportedly injured in the clashes. However, no confirmation was available from police. The BJP had alleged that buses in which party workers were returning from Shah’s rally were ransacked and set on fire allegedly by TMC activists. Echoing similar tone, another BJP leader Kailash Vijayvargiya said that the party won’t get scaredof the tactics adopted by the TMC Chief Mamata Banerjee. “Hum Mamata ji (WB CM) ko chetawani dena chahte hain ki iss prakar BJP ka karyakarta na darne wala hai na jhukne wala hai. Ye Mamata ji ko bahut mehenga padega,ye main kehna chahta hun,” the BJP leader said. However, TMC refuted the allegations and said that BJP itself had hired some hooligans from Jharkhand as they have no issue. ” “Beginning of the end of BJP as a whole has already started & it has started from Bengal. BJP has hired some hooligans from Jharkhand. They are doing this because they have no other issue,” TMC leader Madan Mitra had alleged.